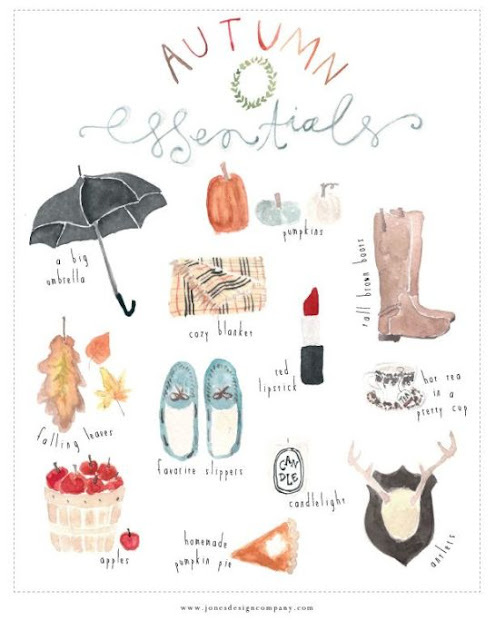 Countdown to fall: three days! In my head, I'm imagining I'll wake up and it will be sixty degrees and boot weather. I can dream, right? This past weekend I was invited to do a Pilates-for-charity event - as in Pilates on a reformer. I had never, ever used a reformer before and I was a bit intimidated given my clumsy, uncoordinated tendencies. And while I definitely had the thought Oh my Lord I'm going to injure myself! several times during the class, I totally loved it. It was actually a group class, choreographed and set to music so it had an upbeat feel, and (since I actually didn't injure myself) the reformed was super fun and exciting (I especially liked pushing off the jump boards and feeling like I was flying :). The studio was darling, and I even walked away with major swag - both the goodie bag and the raffle prize. We got plenty of family time in, hitting up our favorite restaurants and (my favorite) walking while all holding hands. And our new (to us) piano was delivered! 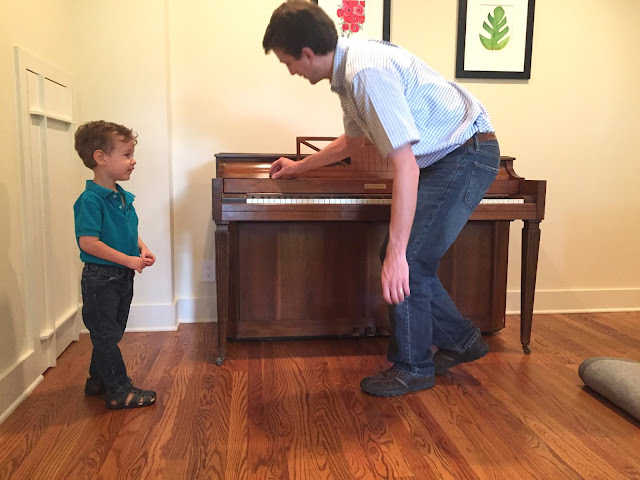 Parker started lessons this year, so he was in need of something on which to practice at home. Little Man was stoked when he realized the "pinano" was staying! 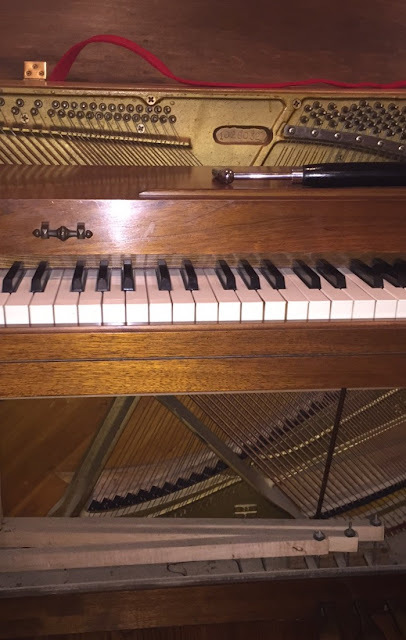 Since it needed to be tuned, husby read up on piano tuning, purchased a kit via Ebay, downloaded the computer software and tuned our piano himself. The funny thing is, I'm not at all surprised. It is 100% him to just pick up some difficult new task, that most of the population would never attempt. He can seriously do. anything. I would love to get our kids in piano lessons! I bet Parker loves it!! 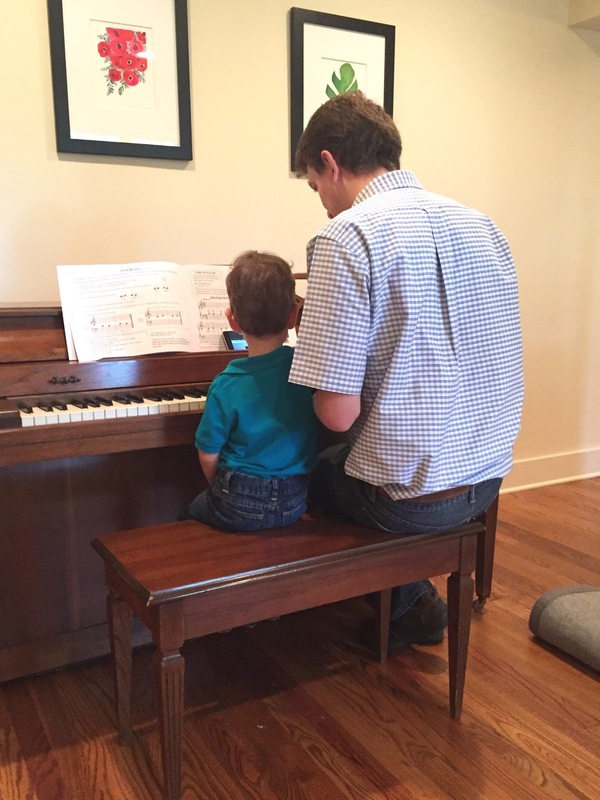 And how crazy that your hubs was able to tune the piano himself!! I guess these days you can literally watch a YouTube video for anything. Haha. I'm sure I still would have failed at it, though. Seriously with the You Tube! Also, we were talking about how difficult tuning must have been back-in-the-day without computer software to decipher the notes! Hand holding is my favorite. I'll hold C's hands till the end of time! Loving the updates on Parker's piano journey! I've been reading your archives and I really admire and appreciate your parenting style and natural childbirth story. We have similar parenting philosophies though I'm not yet a parent ;-) Have a great week! What do I always say? Best Mommy ever! Five on Friday - September!